With 847 Facebook likes, this article takes the number five spot: Old Sled Zone—1969 Ski-Doo Alpine Invader 640 ER. 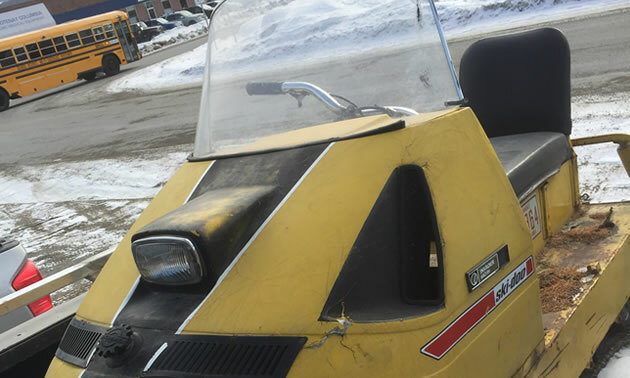 I recently came across a big, bulky 1969 Ski-Doo Alpine Invader 640 ER perched in the back of a pickup truck owned by Gord Martin of Cranbrook. Gord has a number of old sleds, some in original condition like this old Alpine and some in mint, restored condition. This ’69 Ski-Doo Alpine Invader 640 ER is a twin-track workhorse model. (ER stands for electric start and reverse). This old Ski-Doo was originally sold by Hi Performance Sports Ltd, on 1957 Harvey Street, in Kelowna, B.C. 1969 was the year after insurance-salesman-turned-arctic-adventurer Ralph Plaisted and his group made an unbelievable trek to the North Pole riding Ski-Doo Olympiques. Looking at this husky Alpine Invader, they may have been a better choice for the Plaisted Expedition? And remember 1969 was the year that Ski-Doo was leveraging insurance-salesman-turned-arctic-adventurer Ralph Plaisted’s expedition to the North Pole on a Ski-Doo. Evidently, Ski-Doo was originally cool to the idea of sponsoring the Plaisted Polar Expedition but ended up providing the Ski-Doo Olympiques machines for the adventure. After Plaisted's successful trek to the North Pole, Ski-Doo warmed up to idea and used Plaisted's trek as a selling point for the endurance of its Ski-Doo models. We look forward to featuring some of Gord Martin’s and his friends other old snowmobiles in the future. Thanks to Gord for sharing his enthusiasm for these old snowmobiles.